mad orange fools: I really want a fish. I've wanted to get a beta fish for as long as I can remember, but I always talk myself out of it. We do have two cats after all. I suspect Simon might enjoying fishing if given the opportunity. That's Dudley up there in the photo. He belongs to my niece, Cassidy, and he visited his Grandma and Pa's house for Thanksgiving. He hung out by a photo of my mom's irises on a high shelf in the old butler's pantry at my parents' house to avoid being knocked over by the somewhat hyper chocolate lab, Katrina. (Who, for the record, knocked my dad over when we arrived for Thanksgiving Eve dinner. Luckily he fell onto her bed so his landing was cushioned. I'm mad at her though. She's been knocking my parents over a lot lately and it worries me. They're in good shape, but they're not spring chickens anymore.) I think he liked the view. On Thanksgiving morning, I got up on chair to look at him and take some photos. He freaked me out by staring at me and making his eyes bulge out. The Polaroid shutter scared him. Sorry Dudley! The whole staring at me thing threw me off, but eventually I determined that no one had fed him so he was probably trying to communicate his need to eat. Not so different from the cats. 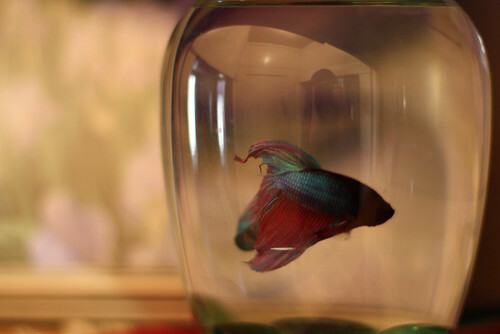 My other niece, Caroline, also has a beta fish, but she left him at home. After traveling with her from Las Cruces, I guess he didn't feel up for the drive to Santa Fe. His name is Patrick. I have never met him. Apparently he is half the size of Dudley. Anyway, I figure if my nieces can keep fish alive, I can too. I just need to figure out a good spot for the fish bowl. I've already got some names picked out. Heath or Mewelde.